Is an organisation whose objective is to encourage the cultivation of Australian plants really suggesting that people should NOT grow those plants? Well....yes! Under certain circumstances. Prickly pear (Optunia sp.) - native to north and central America - devestated thousands of hectares of eastern Australia in the early 1900s until successfully controlled by biological means. Boneseed and bitou bush (Chrysanthemoides monilifera) from South Africa were used for sand dune stabilisation in eastern Australia and have spread rapidly well beyond coastal areas, replacing entire ecosystems. Fireweed, Senecio madagascariensis, (South Africa) has become a serious pest of pasture lands in New South Wales and is also spreading into Queensland. It is a prolific seeder....25,000 to 30,000 seeds per plant with almost 100% germination rate. Melaleuca quinquenervia (native to eastern Australia and New Guinea) has grown uncontrolled in the Florida Everglades to the exclusion of native species. Acacia saligna, A.cyclops, A.melanoxylon, A.mearnsii, and A.decurrens (all Australian natives) are causing serious environmental problems in the South African "fynbos". 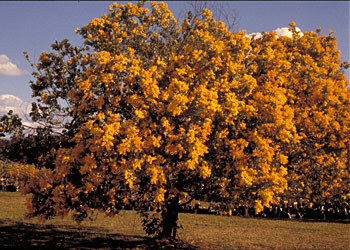 Numerous acacias such as Acacia paradoxa which been reported as being a problem in parts of Victoria, and the popular garden wattles Cootamundra wattle (A.baileyana), Queensland silver wattle (A.podalyriifolia) and golden wreath wattle (A.saligna). These are weeds of the Sydney bush and other areas and should not be planted in gardens in the vicinity of natural bushland. 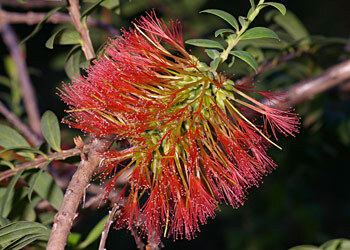 Melaleuca hypericifolia, native to coastal New South Wales, has invaded natural bushland along the south coast of Victoria. 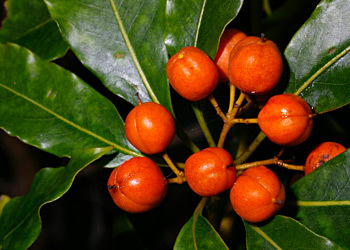 Pittosporum undulatum colonises moist areas, such as gullies, and areas of disturbed soil. It grows rapidly and quickly shades out most other plants. The plant seems to adapt to soils with higher nutrient levels much more readily than other native species, hence grows well in areas where the soil has been changed this way. 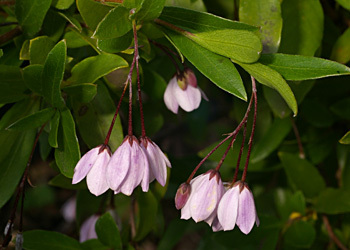 Billardiera heterophylla, native to south Western Australia, has become a serious pest in bushland in the eastern states, particularly in Victoria and Tasmania. Other native species have proved to be opportunist by flourishing in the changed environment when original vegetation is cleared for pasture or agriculture (eg. sheep's burr, Acaena agnipila). ......and there are many, many more. Unfortunately, plants which have become weeds sometimes continue to be sold for garden use in the areas affected. So while we are certainly not suggesting that people should not plant Australian plants, we don't have a policy of "Plant Australian at any cost". We don't want to be responsible for the further spread of existing "ugly Australians" or for the introduction of new weedy species. The information on this page outlines some of the problems that have occurred, some specific plants that have been known to cause problems in certain areas and suggests caution when considering the cultivation of a species which has not been tried in the particular area before. This caution, by the way, applies to ANY new "exotic" plant whether from Australia or anywhere else.